Chico was formerly the head of the public sector audit unit of SizweNtsalubaGobodo, where he serviced state owned enterprises, retirement funds, BEE investment companies, medical schemes and trade unions. With some 35 years in business, Chico has led many assignments in, amongst others, third party business consulting, development and expansion, capital raisings, due diligences, feasibility studies, taxation, tax and estate planning, turnarounds and valuations. Chico qualified as a chartered accountant at Kessel Feinstein (now Grant Thornton). 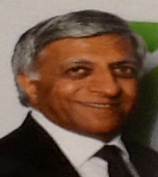 He entered practice under the name Hansjee Patel which subsequently merged to form Gobodo Incorporated and thereafter with Sizwe Ntsaluba vsp to form SizweNtsalubaGobodo Incorporated, the largest black accountancy practice in South Africa. Chico has a Bachelor of Commerce from the University of Durban-Westville (now University of KwaZulu-Natal), a Certificate in the Theory of Accounting (CTA) from the University of Natal (now University of KwaZulu-Natal) and is a Chartered Accountant of South Africa.